Newcomers to the design/futures party are often curious about bridging from abstract talk of possible futures into more tangible exploration -- but such interest doesn't automatically come with a sense of how to begin. 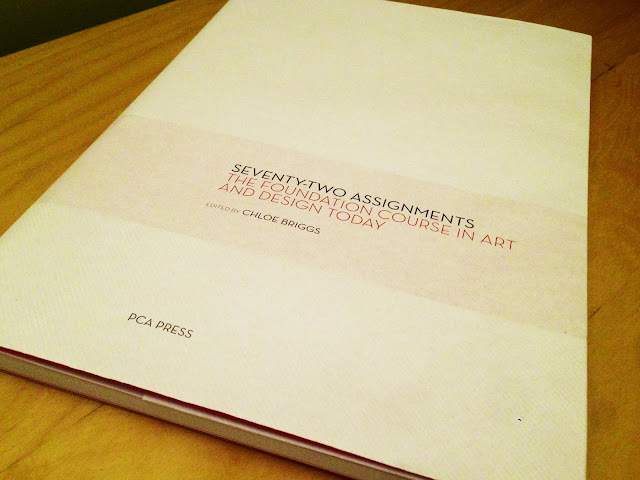 Last year I wrote a piece to provide a possible way to venture into this territory, for an anthology called 72 Assignments: The Foundation Course in Art and Science Today. The 'Time Machine / Reverse Archaeology' assignment embedded below is a free pdf download from Scribd. Published by the Paris College of Art, the collection's premise was to reimagine the Bauhaus Vorkurs ('foundation course'), almost a century after Johannes Itten introduced this landmark in arts education. (The book's working title was 100 Assignments: The Future of the Foundation Course in Art and Design.) Each assignment is meant to be doable within a three-hour window. My piece was intended mainly as a first-timer's scaffolding for translating existing future scenarios into either physical prototypes or immersive situations. (You could tackle it alone, but in a group would be better. You could also do it in three hours, but longer might be easier.) The 'Reverse Archaeology' variant addresses the object-oriented concerns of design fiction. The 'Time Machine' variant exemplifies the more encompassing simulation/situation territory of experiential scenarios. Since publication in late 02013, both versions have given rise to some interesting results. More about those in posts to come. It builds on similar assignments I've set for students at the University of Hawaii at Manoa (02008, with Scott Groeniger), at California College of the Arts (02011, with Jake Dunagan), and at the National University of Singapore (02012, with Aaron Maniam and Noah Raford). It also owes much to the alternative futures processes [pdf] that I learned from Professor Jim Dator and colleagues at the Hawaii Research Center for Futures Studies. The whole idea of sharing materials like syllabi and assignments is bound up with a problem space I'm thinking about a fair bit lately: 'structures of participation' (a phrase borrowed from Natalie Jeremijenko) for designing experiential futures. This interest in structures of participation is about democratisation of the tools, in service of growing a more adept community of practice, in order ultimately to deploy experiential futures -- design fiction, experiential scenarios, etc -- at scale and to greater overall effect in the culture. To hone fluency in one's own practice is a fine thing, but it needs to be learnable in order to scale. And scaling our efforts towards 'social foresight' is the point, I think (see Chapter 7). And so, to that question of democratisation, which might alternatively be framed as a matter of Open-Sourcing design/futures practice; it's nice to see the PCA Press collecting assignments, of all things. I'm now teaching graduate students full time. For three years before that I was consulting full time. A common feature to both areas of work, it seems to me, is that documentation isn't shared as much as it could be. A good deal of both teaching and consulting work seems to take place in bubbles, with no one quite knowing what's happening in others' bubbles. This is a paradox of practice-led discourse. You get practitioners so preoccupied with learning-and-deploying in their own contexts that they don't, for whatever combination of reasons, share as fully as they could, thus depriving the commons of resources that would benefit all. We need quite deliberately and systematically to Open Source the work around which we seek to accelerate collective learning. A disclaimer. The step-by-step process outlined in 'Time Machine / Reverse Archaeology' is probably bleeding obvious in some ways and a bit opaque in others. One or two of the key steps from scenaric premise to concrete future artifact/situation may be reminiscent of the old Monty Python sketch about D.P. Gumby's School of Flower Arranging: "First, take your flowers. Then, arrange them in a vase!" But perfection is not the first step. Getting involved is. To the extent that any how-to guide helps people cross the threshold to a first attempt, it has in an important sense already succeeded. Do get in touch if you decide to try out #timemachine or #reversearchaeology assignments -- it'd be great to hear how you go.